Home » 25 Days of Giving: Saatva Mattress Giveaway! We’re ringing in the third day of our 25 Days of Giving with a special giveaway in which one lucky sleeper will get the chance to win a brand new mattress from Saatva! 25 Days of Giving: Saatva Giveaway! The Saatva mattress combines a luxurious pillow-top layer with two sections of coils for a classic innerspring feel that could be a real hit for those of you in need of some serious bounce and support. Check out our special 25 Days of Giving page to stay up-to-date on all the latest giveaway happenings! So far the Zenhaven sounds the best for a side sleeper like me, but any of these great mattresses would be a huge improvement over what /i have now. The Zenhaven has interested me quite a bit, as has the Ghost. I’m a side sleeper, and like a cooler room for sleeping, but I do like the pillow too here as well. In dier need of a new mattress. Yes, please! Really need a new mattress ! This is a difficult decision to make but I like the Purple Mattress review. From the sound of the reviews this looks like it would be perfect for me! Looks so comfy and I need a new mattress! I would have to go with the Purple. I’ve never owned a Saavta Mattress but would love to give it a try! Thanks for the oppurtunity! My favorite so far is actually a tie between the Zenhaven and the GhostBed Luxe. I am determined to win one of these mattresses!! Please help me sleep well!! Thanks for the chance! Nice mattress, would love to own it. I love so many of the mattresses you have reviewed….and learned more about mattresses than I every thought I would reading your reviews. The Saatva sounds wonderful….not sure I have found a favorite, I like so many of them. We bought a Saatva Loom and Leaf mattress and have really enjoyed it. Would love to win another mattress from Saatva for our guest bedroom. Looks great def need softer though. Would love to know what it takes to win!!!! I’m thinking about a photo of this white haired still pretty (?) sleeping, sitting, dancing, whatever – -on a Saatva mattress with a clever caption as to the benefits of the Saatva in “Living Long and and happily”. What a Chanukah and Xmas gift!!!!! Saatva? I like all of them! The Saatva looks like the best choice for me. I really like this mattress! I like the Zenhaven but they are all nice!! The luxurious pillow top is what drawing me to the Saatva mattress. Looks like an amazing mattress! Sign me up! To me, the Zenhaven seems like the perfect LATEX mattress, because me & the hubby are both side sleepers. BUT, this Saatva mattress sounds really nice. Kinda different, but so much better than what we have now! I would love the Saatva! The Zenhaven, since we are both side sleepers. I would be happy with any one of these. i like that its the pillow top with innerspring coils. and absolutely love that you can flip it. I have a memory foam mattress and absolutely hate it! It’s definitely NOT flippable! Santa would be my 1st choice for sure!! This mattress would make my son’s day! (Or rather, his night, lol!) He needs a new one soooo badly! I’m loving the Casper or The Saatva in need of lower back relief!! I’m excited for this giveaway! I hope I win one of these mattresses. It would be wonderfuL! The Saatva Mattress is very nice. Would love to try this mattress! Thanks! It is so hard to pick just one since they all have great qualities. I am drawn to the purple mattress. I like the fact that the Saatva also has inner spring coils in addition to the memory foam..kind of like having your cake and eating it too!! Also I see it’s very popular..ads on TV all time!! I’m going to keep trying as much and as hard as I can. To win my daughter a new mattress. All these amazing reviews makes it hard to pick just one! One of my favorite reviews you all did was the Tempurpedic Cloud Supreme ~ the ultimate in luxurious softness. I’ve been researching mattresses for years, and I’ve always been dying to have a Saatva!! So far I think Nector is my favorite,I am a side sleeper and need a good mattress for me to sleep on my side but I would be happy with any of these mattresses. Thank you Sleepopolis for this great contest! My broken body would so appreciate the “Saatva” just know it would fit my needs, so grateful for the chance to win ,Thank You! The Zenhaven and Latex for Less mattresses sound perfect for me! I like them all. Each review makes it harder to choose because they all are great. I love the saatva. The name is amazing. Of the best latex mattresses reviewed, Spindle is my favorite. I absolutely am in LOVE with the Saatva mattress! I am amazed at how well it’s made and how comfortable and supportive it looks. This looks like another wonderful mattress. I think this has to be my favorite so far! My husband and I are sleeping on the same mattress 🛏 we’ve had for 10 years! Hoping upon hope to win! Purple is still my favorite. The Ghost Bed is my favorite. Almost bought one last week but it wasn’t quite in the budget for this year. 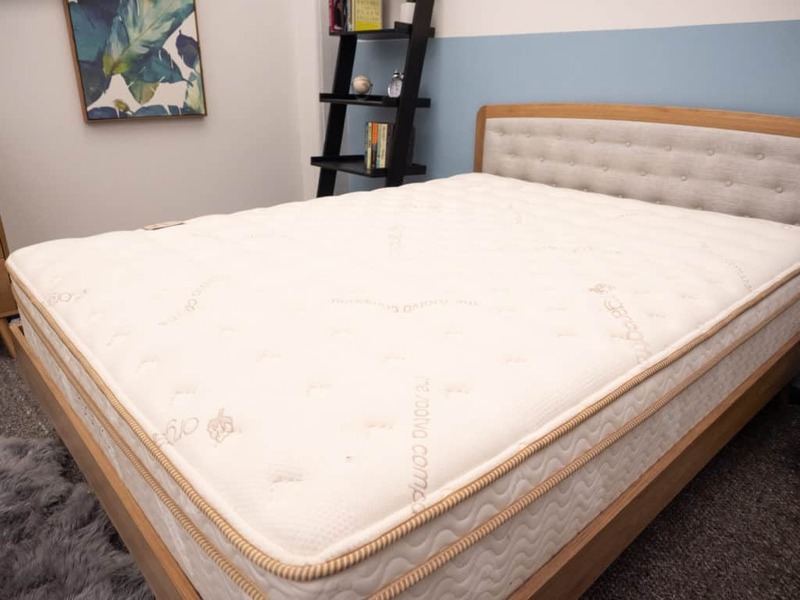 The Saatva mattress combines a luxurious pillow-top layer with two sections of coils for a classic innerspring feel that could be a real hit for those of you in need of some serious bounce and support. Meaning that if you need bounce and support this is the mattress for you. I would love to win it! The Saatva mattress is my favorite. Please choose me as a winner I’m a single mom I can’t for new mattress I my mattress killing my back I really need this. I love the review on the ghostbed. I would love this mattress for my mother, thank you! I moved recently over night. I have a bed that sinks in the middle and squeaks when I move…waking me up every time. This would be a dream come true to win and actually get a good nights sleep..sleeping through the nights. The Saatva mattress would be a good mattress for me to rest on. Looks like a wonderful mattress full of spring and support. 25 Days of Giving: Saatva Giveaway! The Saatva mattress is my fav ! Being used to a traditional innerspring mattress I’m definitely interested in the Saatva, especially with the euro pillow top. Not sure I’d like the firm, I like to sink in a bit but still want really good support. My favorite mattress is the Leesa mattress! ! I really like the Zenhaven and the Spindle. Love the Saatva mattress combined with a luxurious pillow-top layer and I’d love to win. Thanks for the awesome opportunity and chance. You need a good mattress for a good night’s sleep. I like that this mattress has the classic innerspring feel! And I’ve always loved a good pillow top mattress so I think this Saatva would be a great fit for me! I think the best latex mattress you have reviewed is the Nest Bedding Latex Hybrid! I like the quality! I think it surpasses the others!! beautiful looking bed! haven’t slept on a bed in almost 20 years, currently sleep on a futon. everyone has problems and mine are common, never look for help or dream of winning the lottery. would just like to have something nice to happen for me! Saatva is a great brand. thank you for sponsoring these contests and giving us the chance to win great mattresses! The Saatva would be really great since we are seniors and keep water and juice by the bed. It being water proof would be great since my husband has medical problems and his hands shake. This would be really great for us..
Sooo nice! I would love to have this mattress. MERRY CHRISTMAS SLEEPOPOLIS!!!! Thanks for all the generous giveaways . Zenhaven looks good to me. Love to have a new mattress! Sounds like a great mattress! This sounds like a very nice mattress! The Zenhaven is the best latex mattress in my opinion as it is for side-sleepers like myself! Would love to win a new mattress because my current one is starting to hurt my back. I’m a die hard side sleeper and I really love the Zenhaven mattress. Thank You !! is there a latex mattress version in this brand? I like the Purple mattress. I am a side sleeper. The Saatva Mattress looks amazing! This looks like an impressive mattress. The Saatva mattress seems great! Love your mattresses, need one too. I love the Tempurpedic Cloud Supreme Mattress the best being a side sleeper! I like 3 in particular. Avacado was one of them I like a lot. How awesome would it be to win this great mattress! Maybe if I win. I can get some sleep.